Available in Grey or Sky Blue. 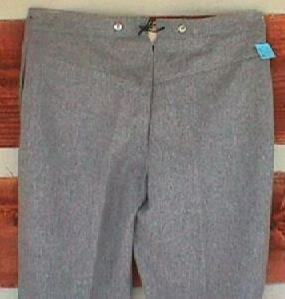 These pants are 100% wool and have side slash pockets and suspender buttons. Waist band is lined with cotton muslin. Also available are Sky Blue Trousers with Gold stripe down each leg (Cavalry) and Sky Blue Trousers with Red stripe down each leg (Artillery) for $59.95 per pair plus shipping.